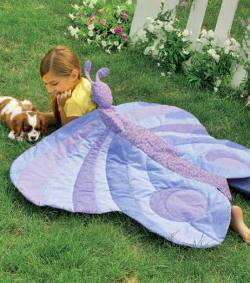 Make a butterfly quilt - great for kids! This adorable quilt is both playful and decorative. Use it as a mat for baby’s play time, as a fun wall decoration for a toddler, or as a great prop for a child’s imagination. Consider adding ribbons at the base of the butterfly’s “head” to give small hands something to hold as they fly through the room. Tip: Have the patterns enlarged for just a few dollars at a copy shop.